For an international company, exhibiting for the first time in a North American trade show presents exciting opportunities — and challenges. The greatest hurdle is adapting to different rules and practices that impact exhibit design; what applies on one continent may not apply on another. 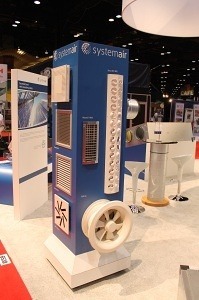 Systemair, a leading ventilation company with operations in 42 countries in Europe, North and South America, the Middle East, Asia, Africa and Australia, experienced such a transition firsthand as it prepared to exhibit at the AHR Expo, an international air conditioning, heating and refrigerating trade show held in the U.S. A well-established brand in other parts of the world, Systemair needed a partner with a track record of ushering international brands into American exhibit halls. To assure a successful experience, Systemair turned to Nimlok Chicago. “With a first-time client like Systemair, we invest significant time in understanding up front what needs to be achieved,” says Maria Valdovinos, Nimlok Chicago Account Executive. Communicating entirely via phone and email with Alexey Alimov, Systemair Marketing Coordinator, the Nimlok Chicago team developed an exhibit design, then got to work building a 30-foot by 22-foot island booth that was consistent with Systemair’s international presence. Key was giving the company’s products center stage. Nimlok Chicago constructed an 8-foot freestanding tower and multiple custom woodwork platforms on which products could be mounted. Fabrication and large-format printing — including color matching — also seamlessly translated the Systemair brand. Before the show, Systemair’s new booth was set up in Nimlok Chicago’s warehouse, and photographs were sent to Alimov in Canada to confirm the right look had been achieved. Later at the AHR Expo, Alimov found the exhibit design comfortably accommodated a flow of visitors; even a competitor commented that it was an impressive display. 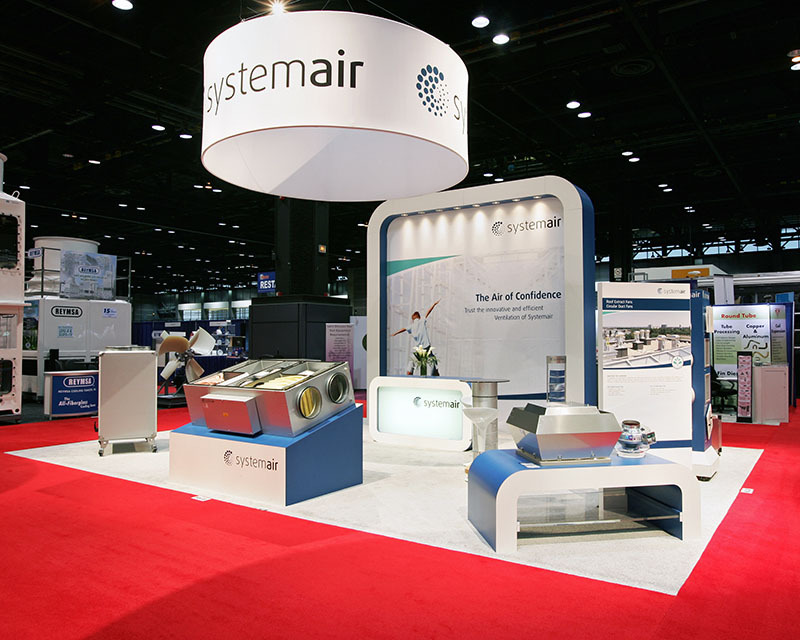 Before the show, Systemair’s new booth was set up in Nimlok Chicago’s warehouse, and photographs were sent to Alimov in Canada to confirm the right look had been achieved. 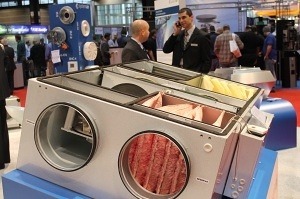 Later at the AHR Expo, Alimov found the booth comfortably accommodated a flow of visitors; even a competitor commented that it was an impressive display. Sandra is Nimlok Chicago’s marketing guru. She enjoys all things dog-related, and spends most of her “free” time chasing after her rambunctious German Shepherd puppy, Luka.